The U.S. Air Force National Air and Space Intelligence Center (NASIC) has quietly published a corrected report on the world’s Ballistic and Cruise Missile Threats that deletes a previously identified Russian ground-launched cruise missile. The earlier version, published on June 26, 2017, identified a “ground” version of the 3M-14 land-attack cruise missile that appeared to identify the ground-launched cruise missile the United States has accused Russia of testing and deploying in violation of the 1987 INF Treaty. The corrected version, available on the NASIC web site, no longer lists a “ground” version of the 3M-14 (popularly referred to as Kalibr) but only ship- and submarine-launched versions of the missile. Apart from correcting the spelling of the North Korean Bukkeukseong-2 medium-range ballistic missile and downgrading the operational status of the Iranian Shahab-3 medium-range ballistic missile from deployed with “fewer than 50” launchers to “undetermined,” the deletion of the “ground” version of the Russian 3M-14 appears to be the only correction in the new NASIC report. (Curiously, the report still doesn’t identify the Russian Kh-102 air-launched cruise missile). Other than these changes buried deep in the report, however, there are no external markings on the new version to indicate that it has been changed (the URL identifies the new report date as July 21, 2017). The older version of the NASIC report has been deleted from the NASIC web site, but a copy can be found here. The deletion of the 3M-14 as the apparent INF-violating missile from the NASIC report is noteworthy, but it doesn’t actually change much. In essence, it returns the public INF debate to square one where it was three months ago. The correction even helps clear up confusion about the origins and status of the alleged Russian INF violation (several of us in the GNO community have been trying to crosscheck and cross-reference missile designations). The United States has refused to publicly identify the INF-violating ground-launched cruise missile, apparently to protect intelligence sources. Instead, government sources have described what the missile is not (see here for previous statements). 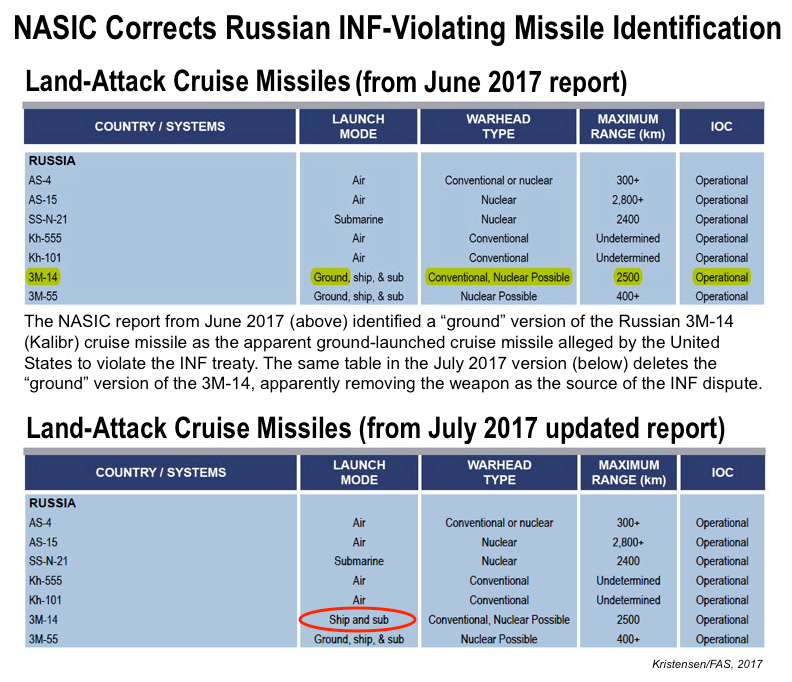 Although NASIC took the time to correct the error, it missed the opportunity to identify the actual INF-violating ground-launched cruise missile. The correction refocuses the attention back on what I’ve heard all along: That the Russian INF-violating missile is thought to be a modification of the ground-launched SSC-7, a short-range cruise missile used on the Iskander system. But U.S. intelligence officials are adamant that the INF-violating missile is not the Iskander but a state-of-the-art missile. The new missile is known in the U.S. intelligence community as the SSC-8. The launcher itself apparently is physically different from the one used for the SSC-7. I co-authored a paper about this with the Deep Cuts Commission in April. Apparently one battalion is operational and a second is fitting out, potentially embedded with Islander battalions starting in central Russia, and deployments are expected eventually in all four Russian military districts. So far, however, according to U.S. officials, the SSC-8 does not appear to give Russia any military advantage in Europe. And the U.S. military already has the military capability to counter the SSC-8 with sea- and air-launched cruise missiles and other means. The U.S. refusal to identify the missile has given the Russian government the public space to “play ignorant” and claim it doesn’t know what the U.S. government is talking about. Similarly, the secrecy has made it difficult for allied governments to verify the claim and privately and publicly assist the United States with putting pressure on Russia to return to treaty compliance. That, in turn, has allowed hardliners in the U.S. Congress to propose that the United States should also develop it’s own ground-launched cruise missile (something the U.S. military does not believe is necessary). Rather than making a bad situation worse, in order to sustain and increase pressure on Russia to return to INF compliance, the United States must reinforce its own commitment to the treaty by rejecting any Cold War proposal to mimic Russia’s bad behavior by developing a U.S. ground-launched cruise missile and instead focus potential military responses on existing forces already widely available, remove public ambiguity by identifying the Russia missile and disclose the information it has shared with Russia (if it can tell the Kremlin, then it can also tell the rest of the world), increase intelligence sharing with allies to improve their ability to work the issue with Russia directly, and pursue the matter directly with Russia in the Special Versification Commission of the INF treaty. This publication was made possible by a grant from the Carnegie Corporation of New York, the New Land Foundation, and the Ploughshares Fund. The statements made and views expressed are solely the responsibility of the author. NASIC made a mistake and they were asked to correct it. It doesn’t change anything on the ground: Russia has still violated INF, but with a GLCM based on a modification of the SSC-7 instead of the 3M-14. It would be very challenging and expensive to build an effective cruise missile defense system. As with the ballistic missile defenses, it could probably relatively easy be fooled with countermeasures. Besides, the US and its allies have been living with the threat of cruise missiles for decades. So a decision to develop and deploy a cruise missile defense system must first be required to explain why this is so essential now. Hans M. Kristensen is the director of the Nuclear Information Project at the Federation of American Scientists where he provides the public with analysis and background information about the status of nuclear forces and the role of nuclear weapons.